View cart “Hand Stamped Chrome “Pole Dancer” Circlet Necklace:” has been added to your cart. This unique set was carefully crafted from a vintage spoon whose age has developed the most beautiful sheen! 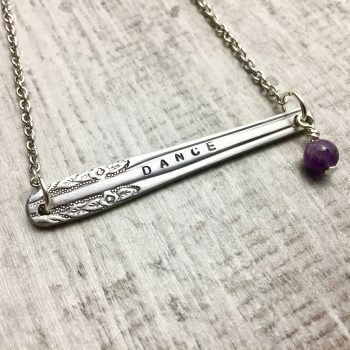 Hand wrapped amethyst beading adorn both the necklace and earrings and the spoon is hand-stamped with ‘DANCE’. Elegant and charming, this is a unique one of a kind piece. Pendant Length: 1 1/4 inch. Earring Length: 1 1/4 inch + earring hooks. Earring Weight: 3.7 g (together). Ultra light earrings!